What could cause me to get me up before 6 on a Saturday morning? I’d say the chance to commiserate with the shoppers at the Tower Grove Farmers Market. 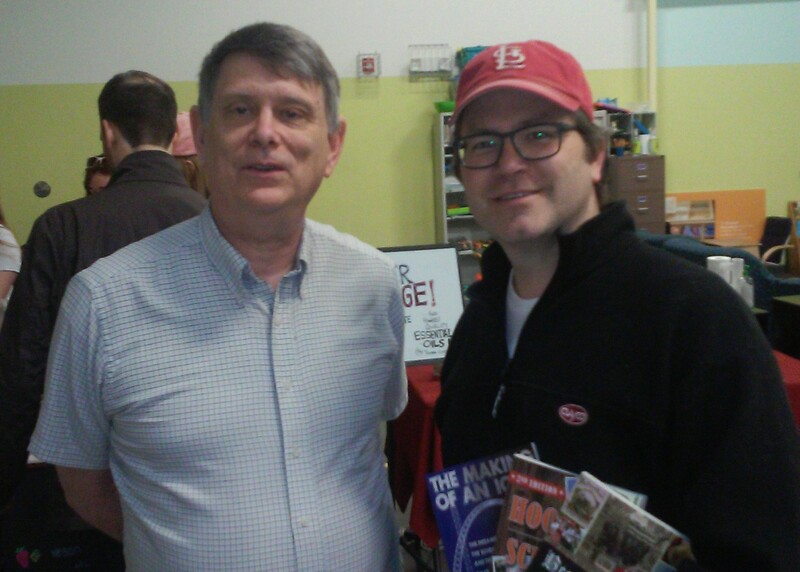 I had a stupendous time selling and signing my books this morning at the market. 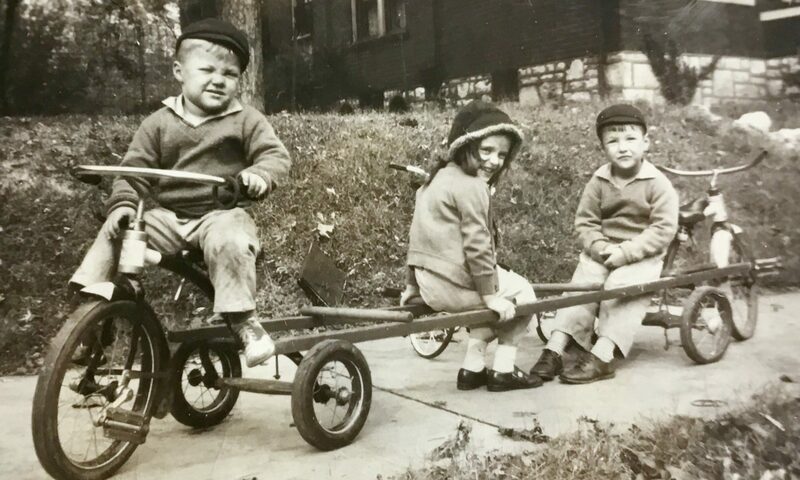 Actually, because of a conflict, the market was at the City Garden Montessori School, at 1618 Tower Grove Avenue. 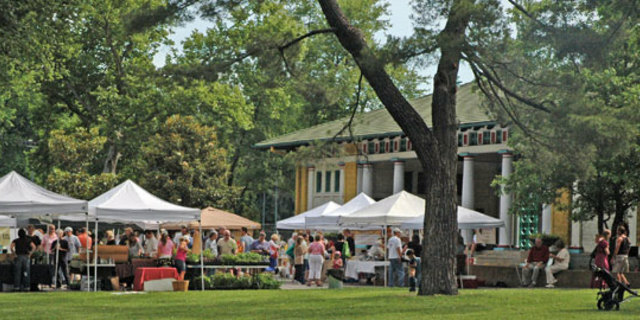 But I’ll be there when the morning market is in Tower Grove Park on May 16, May 23, June 13, July 4, August 1, August 8 and August 15. The guy above bought all three books. So did C.A. Lefton, below. 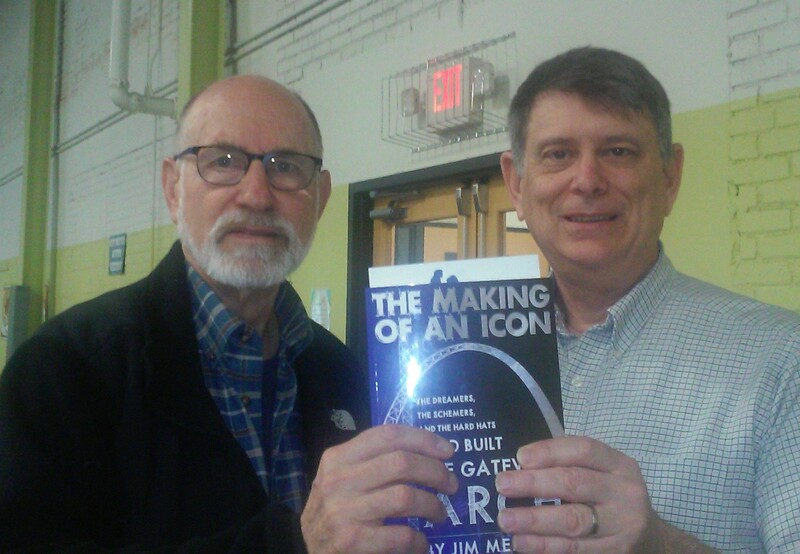 Doug Schneider, an early bird buyer, grabbed a copy of The Making of an Icon. The shoppers I spoke with were fascinating people, just as you’d expect on the South Side. I hope to see you when I’m next there, on May 16. Here’s an unpublished essay I wrote not long ago. It has to do with the aftermath of Camp Jackson, a subject of my book, Beer, Brats, and Baseball: St. Louis Germans. Historians record that any chance Confederates would rule Missouri ended in an action on May 10, 1861 on what is now the Saint Louis University campus east of Grand Boulevard. That day, thousands of German immigrant volunteers commanded by Captain Nathaniel Lyon surrounded a state militia camp dominated by secessionists under General Daniel Marsh Frost and forced its surrender. So shall it always be that Lyon vanquished Frost at Camp Jackson. Or maybe not. There is one way that Frost came to be the final victor, but only one way. After Frost presided over the surrender of Camp Jackson, he was pardoned and went on to be a brigadier general in the Confederate Army. He later fled to Canada and declared his allegience to America after the Union victory in 1865. After Frost’s first wife died in 1872, he remarried in 1874 and had two daughters in his fifties, Edith and Harriet (Hatty). Frost died in 1900, the same year Hatty married Samuel Wesley Fordyce, who would become a wealthy lawyer. Samuel became a wealthy lawyer and died in 1948. Hatty became a major benefactor to Saint Louis University and in 1959 contributed $1,050,000 to help the university acquire 22.5 acres east of Grand Boulevard. The land included the site of Camp Jackson. In return, the university agreed to name the north campus on both sides of Grand after the man who surrendered Camp Jackson. From then on, it would be known as the Frost Campus, after General Daniel Marsh Frost. The statue remained at the site for three decades to remind all who passed by of what Lyon and his Dutchmen did on that spot on May 10, 1861. But then came a new owner, a university funded by Hatty Fordyce, the daughter of the man Lyon had forced to surrender. And someone decided that there was no room for Nathaniel Lyon’s statue on all of the 22.5 acres the university had acquired. So it was moved to Lyon Park at Broadway and Arsenal Street, in a virtual retreat back to the arsenal where the captain and his German volunteers began. Was the hand of Hatty Fordyce in the move? One account that seems to back up that idea came from a Jesuit priest and Saint Louis University English and American Studies professor named Joseph G. Knapp. He was close to Fordyce and wrote a history of the Frost and Fordyce families in a 1979 book called The Presence of the Past. Saint Louis University Press was the publisher; it makes sense that the university wouldn’t allow the volume to go to press if it disputed the facts presented therein. And yet, a statue of General Lyon, leaning a little off his horse, stood on the original site of Camp Jackson, the present site of Grand and West Pine. An analogy to a statue of Benedict Arnold at Mount Vernon is perhaps too dramatic, but the embarrassment was keen, especially since the university promised to rename the north campus Frost Campus in perpetuum . . . However, a public monument is not that easily moved, especially when it must be moved at night. Oral history reveals that it cost the University $1,600, through the kindness of a former mayor, who arranged, in bar after bar, for drinks on the house in return for signatures of citizens who ‘petitioned’ that the statue of General Lyon be moved to what is now Lyon Park. In the end – almost a hundred years later – General Frost had finally triumphed over General Lyon, thanks to the devotion of his daughter Hatty. Whoever ordered the statue moved, it seemed a figurative victory for General Frost. But only figuratively, nothing more. For there is a greater monument cast by Captain Lyon and his Germans that kept Missouri in the Union that day in May at Camp Jackson. That one no one can move. 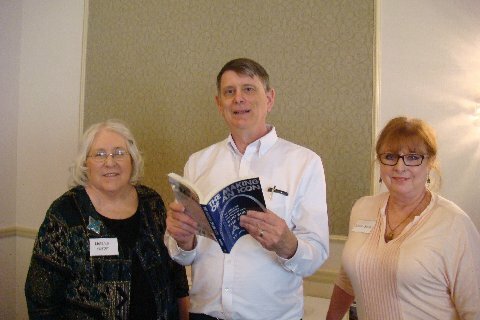 I had an awesome time talking about The Making of an Icon: The Dreamers, the Schemers, and the Hard Hats Who Built the Gateway Arch at a meeting of the College Club of St. Louis at the Sunset Country Club in Sunset Hills on Tuesday. I could tell the audience really appreciated the monument. The club does great work giving out college scholarships to deserving women. 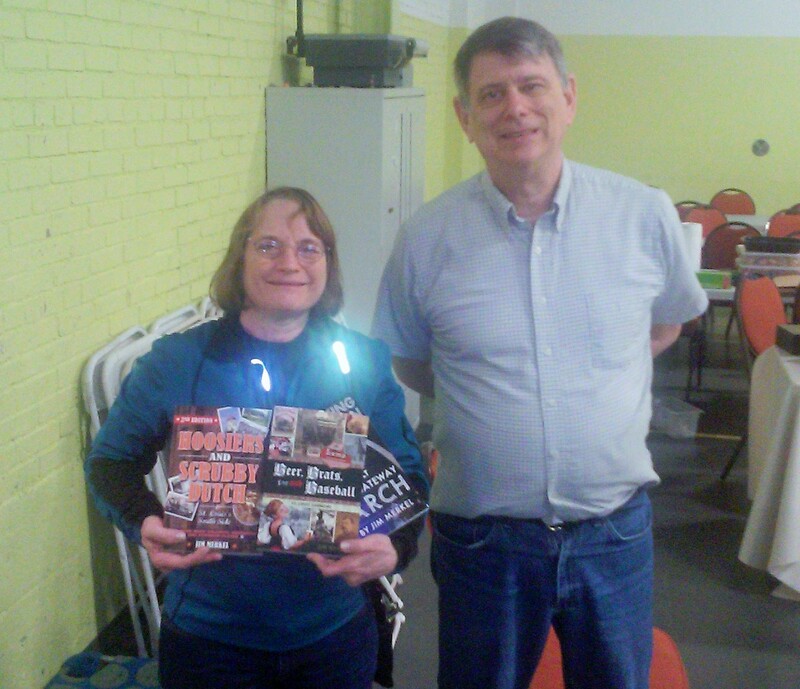 With me in the photo are Melanie Foster (left) and Eileen Scott of the club.